Range of visibility, present weather and ceilometer type sensors for aviation, meteorology and research applications. 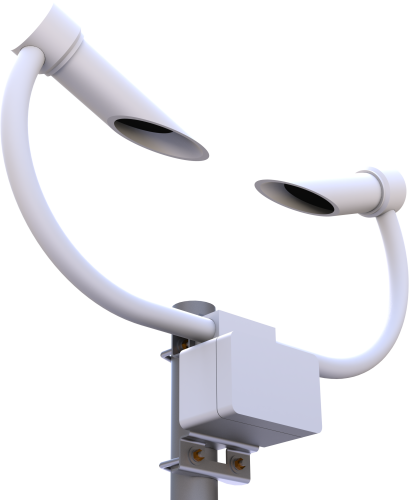 Designed and manufactured in the UK and used across the world in some of the most extreme climates to measure precipitation, precipitation type, cloud height and visibility. Is there a calibration procedure for the PWS100? Yes. For in-situ calibration by the user, use the PWC100 (Calibrator for PWS100). There is a separate PWC100 instruction manual. What is the current drain of the PWS100? The basic processing current of the PWS100 is <200 mA at 12 V supply. However, the sensor has two levels of heating available. One set of heaters—known as the dew heaters—prevents condensation on the main lenses of the sensor. When these sensors turn on, the current usage increases to approximately 500 mA at 12 V. A current drain of 1 A is the worst case scenario if the input supply to the sensor drops to the minimum of approximately 9 V (the current drain increasing at lower voltages). By default, the dew heaters turn on all the time and the main hood heaters are off. The dew heaters can be turned off by the user. The main hood heaters run from a separate power supply and consume 7 A at 24 V when fully on. The main hood heaters only need to be used when icing conditions are likely. How can a copy of the PWS100 Present Weather Viewing Software be obtained? The Present Weather Viewer is available for download from the Downloads section of the PWS100 product page.